The Quadrilateral Security Dialogue (Quad)—an informal security framework between Japan, the US, Australia and India—has been facing some perception challenges, including a common view that it antagonises China and challenges ASEAN, and hence would enjoy little regional support. But there has been little empirical data to back such views. 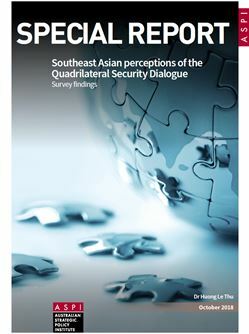 This study tested perceptions of the Quad among the Southeast Asian policy and expert communities through a quantitative survey. It collected 276 answers from staff from government agencies, militaries, academia, think tanks, businesses, media and university students from all 10 ASEAN countries. This is the first and so far the only comprehensive study of Southeast Asian perceptions of the Quad. Using original data, it provides an accurate overview of regional sentiments and informs Southeast Asians about the existing gaps between their views. Based on the findings, this report suggests recommendations for Quad members on how to develop the Quad initiative in ways that complement regional cooperation. It also provides recommendations for the ASEAN countries on how they should further engage with the Quad for common benefit. Southeast Asian perceptions of the Quad are diverse. There’s no such thing as one ‘ASEAN view’. Some findings confirm expectations; for example, Vietnamese and Filipino respondents were most supportive, while Indonesian respondents were among the most sceptical or undecided. Surprisingly, Singaporean respondents are least enthusiastic about the Quad. Still, a majority opinion (57%) across the ASEAN respondents supports the Quad initiative as having a useful role in regional security; only 10% of respondents oppose it, while 39% indicate they would support it in future if the Quad successfully materialises. A plurality (46%) of respondents think that the Quad complements existing ASEAN-centred regional security frameworks. Those who worry about the Quad challenging (18%) or sidelining (17%) ASEAN centrality are a minority; another 13% think that the Quad has no effect on ASEAN centrality whatsoever. There are reservations that the ‘anti-China’ nature of the Quad is dangerous (19%), but more think that ‘being an anti-China bulwark’ is necessary (35%). In total, 54% of respondents see the Quad as an ‘anti-China bulwark’, 28% think that it shouldn’t be perceived that way, and 15% think that, while the Quad isn’t anti-China, it projects itself as anti-China. The ambivalence of the views is visible in the nearly equal proportions of respondents who believed the Quad would, and those who thought it wouldn’t, affect their country’s security. Thirty-two per cent of respondents welcome the Quad and believe that their countries will be safer because of it, while 31% believe it could raise tensions in the region but won’t affect their countries. Most questions about the Quad received diverse responses, and few issues got a majority answer. An important exception, with an overwhelming positive response of 69%, was that the Quad is expected to enforce the rules-based order (for example, the 2016 Arbitral Tribunal’s ruling on territorial claims in the South China Sea). This particular issue gained the highest agreement among all the respondents.